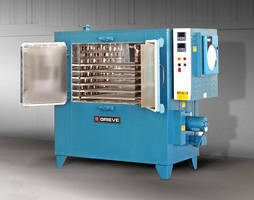 The 343°C Cabinet Oven is offered with Type 430 stainless steel interior and two rollout shelves. The oven comes with workspace measuring 38 x 38 x 38 in. (W x D x H) and are equipped with a 1000 CFM, 1 HP re-circulating blower. It is designed with manual reset excess temperature control with separate controller and a 10 in. diameter circular chart recorder. The unit features a 6 in. insulated walls and an aluminized steel exterior. No. 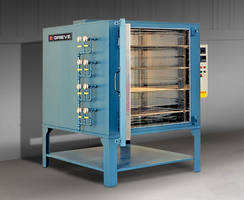 903 is a 650°F (343°C), cabinet oven from Grieve, currently used for holding large parts on rollout shelves at the customer’s facility. 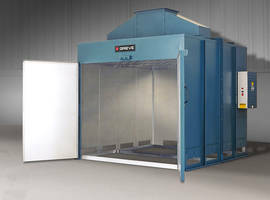 Workspace dimensions of this oven measure 38” W x 38” D x 38” H. 40 KW are installed in Incoloy sheathed tubular heating elements, while a 1000 CFM, 1-HP recirculating blower provides horizontal airflow to the workload. 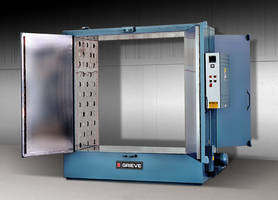 This Grieve cabinet oven has 6” insulated walls and an aluminized steel exterior. Features include Type 430 stainless steel interior and two (2) rollout shelves, 28” wide x 37” long rated 150 lbs. loading each. Additional features include safety equipment for handling flammable solvents. Controls on the No. 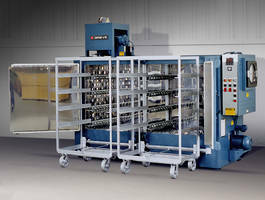 903 include a digital indicating temperature controller, manual reset excess temperature controller with separate contactors, recirculating blower airflow safety switch, 10” diameter circular chart recorder and fused disconnect switch. For more information, please contact: THE GRIEVE CORPORATION, 500 Hart Road, Round Lake, Illinois 60073-2835 USA. Phone: (847) 546-8225. Fax: (847) 546-9210. Web: www.grievecorp.com. 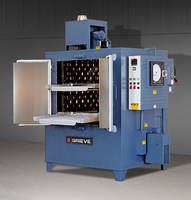 Email: sales@grievecorp.com.